The Park Hotel, Montrose last Thursday, May 22. A row of well-worn packs lines the outside wall. In the entrance hall lie a scattering of grubby hiking boots and trail shoes. Looking somewhat out of place, weather-beaten walkers in outdoor clothing stand round drinking beer, celebrating their walk across Scotland on the TGO Challenge. Everyone here has walked from the west coast by a wide variety of routes, along glens and lochsides, through passes, over summits. Upstairs is the heart of the Challenge, the organisation room where Roger Smith and a team of volunteers has monitored walkers, taking phone calls, sorting out problems and generally being helpful. Here walkers check in, their crossing officially over. Arriving at the Park Hotel is always a little overwhelming for me as I’ve usually seen few if any other Challengers on my walk and the sudden mass of people and welter of conversations is a shock, albeit a welcome one. This year, my 12th crossing, was no exception as I’d only met a few Challengers on the train to my starting point at Lochailort and then spoken to just two more during my crossing. That evening Challengers crammed into the hotel dining room for a celebratory dinner and a series of awards and acknowledgements for Challengers and all those who help with the event both here and along the way. It’s a warm, friendly and boisterous occasion and afterwards conversations continue long into the night. Whilst I am happy to see no one whilst out in the wilds I love meeting people here and swapping stories and experiences. As well as old friends there are new people to talk with and some who I only knew through email and blogs. One of the last was Darren Christie who deserves double congratulations, both for finishing his first Challenge and just a few days later racking up 2017 signatures by the end of the final day for his petition to legalise wild camping in England. You can read about this on his blog. And the walk itself? It was enjoyable of course, as two weeks backpacking in wild country always is. Scottish weather is always unpredictable but I think this year’s was the oddest I’ve experienced. I set off in hot, humid weather under a blanket of cloud. A few midges were biting at my first camp beside Loch Beoraid, the earliest I’ve ever known them. There were no more, which was good as I didn’t take any insect repellent. The next day I sweated upwards through the damp, enervating clouds to emerge at 800 metres into fresh, clear air and spacious views over the spiky hills of Moidart and Knoydart. Below thick grey clouds filled the glens. By evening the clouds were thinning and this was the pattern for most of the first week – clouds and mist building overnight then dissipating during the afternoon and evening. This reversed abruptly the second week with the clearest weather now at dawn and clouds building during the day. Although damp when in them the clouds produced little rain and this was probably the driest crossing I’ve made. I only wore my waterproof jacket twice and the first time was only for an hour. The second was for most of a day as I crossed Lochnagar in heavy showers. Otherwise rain only fell at night, which is how it should be. After the first few hot days temperatures were on the cold side, with ice in my water bottles on four mornings and a cold east wind that made windproof clothing essential. The highlight of the walk was camping on the summit of Ben Nevis, which I’ll write about in the future. But as always there was much that was intense and mesmerising, full of the wonder and glory of nature. Traversing the Sgurr nan Coireachan – Sgurr Thuilm ridge above a sea of clouds, waking beside Loch Treig to a clear sky and perfect reflections in the water, winding in and out of the clouds on the Grey Corries, watching two golden eagles circling, the amazing wealth of bird life in Glen Lee and Glen Esk. 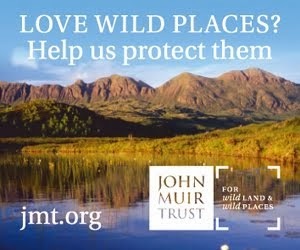 All these and much more are reasons for walking across the Highlands and why I keep going back. 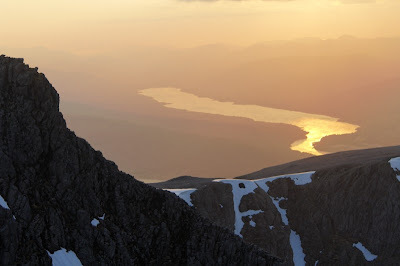 The picture shows evening light over Loch Eil from the summit of Ben Nevis. Photo info: Canon EOS 350D, Canon EF-S 18-55 mm IS@ 51mm, f5.6@1/125, ISO 200, raw file converted to JPEG in DxO Optics Pro. The Findhorn River rises in the remote heart of the Monadh Liath (grey hills) in the Scottish Highlands and flows 62 miles east to Findhorn Bay. Over its course this beautiful wild river runs from vast rolling heather and bog moorlands to lowlands rich with forests and meadows. I live some 10 miles from the Findhorn and often cross it on the A9 road as I head for Inverness and the hills of the north-west. I visit Findhorn Bay regularly too, my closest stretch of coast and a wonderful place for watching birds and seals and the great expanse of the sea and sky. And I’ve walked close to the Findhorn’s source when climbing rounded, boggy, isolated and little-visited Carn na Saobhaidhe and strolled along the gentler wooded banks at Randolph’s Leap much lower down the river. But I’ve never explored the Findhorn closely, never walked very far along its banks or thought much about its place in the landscape. Jamie Whittle, who was brought up close to the Findhorn and knows it well, has done both and describes two journeys along the river, by foot from sea to source and by canoe down the lower river to the sea, in this thought-provoking and interesting book. Whittle uses the journeys to discuss humanity’s relationship with nature and some possible solutions to the problems caused by dislocation from wild places and blends together history, myths, ecology, geology, psychology, philosophy, economics, politics and culture, all interspersed with snippets of poetry. Other writers are brought into the mix and he quotes widely - from obscure local history books to luminaries of wilderness thinking such as John Muir, Henry David Thoreau and, especially, Aldo Leopold. It is encouraging to see Leopold’s Land Ethic – “a thing is right when it tends to preserve the integrity, stability, and beauty of the biotic community. It is wrong when it tends otherwise” – applied to the question of wind farms in the Monadh Liath, and by implication the whole of the Scottish Highlands. 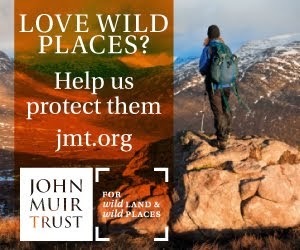 Rightly, Whittle concludes that “these mountains are too fragile to absorb heavy industry” and answers the charge that biodiversity and wild land must be sacrificed in order to combat climate change by saying that this is a false choice and that “if in order to tackle the climate we destroy natural capital then we have failed”. At the same time that serious issues are discussed and faced the author also describes the joy in travelling through the wilds and camping out at night. His affection and closeness to the land shines through. 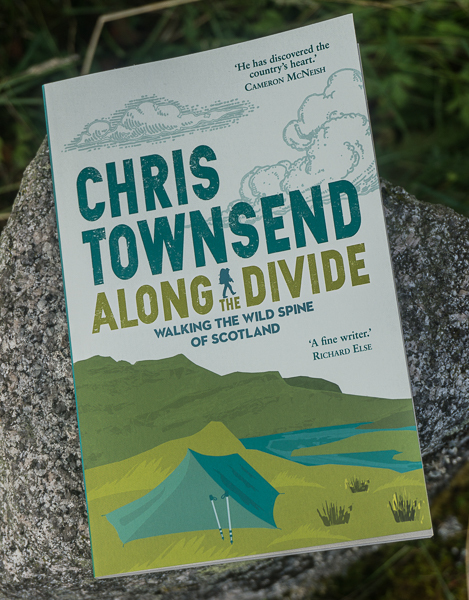 There’s no need to have heard of the Findhorn or know where it is to enjoy this very readable book. For any one who loves wild nature and is concerned about what is happening White River is highly recommended. 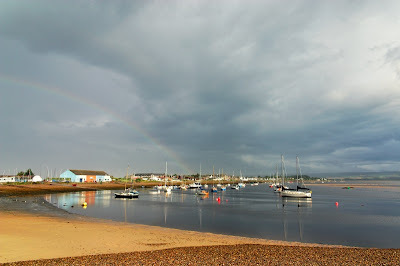 The picture shows storm light over Findhorn Bay. Photo info: Canon EOS 300D, Canon EF-S 18-55 mm@ 18mm, f5.6@1/251, ISO 100, raw file converted to JPEG in DxO Optics Pro.